Last weekend, my neighbor Ashley messaged me saying she was stopping by to bring over a white chicken chili she had made, that was slow cooker ready. She and I swap meals each week and it is always fun trying new recipes from other people! My family LOVES chili, so we all were quite excited!! She had prepared the chili ahead of cooking it, and turned it into a freezer meal by putting everything into separate Ziploc bags. Since I planned on eating it that day, I stuck it right into my slow cooker, but if you wanted to save it for another night, simply place the Ziploc bag into your freezer. This chili was packed with flavor. Beans, white corn, diced chicken, all combined with a hearty base. Some cheese, sour cream, and green onion added at the end made this even better! My family all loved this and had the leftovers the next night. Not only did I not have to make the dinner thanks to Ashley, but it was a slow cooker meal, which meant even less work for me!! 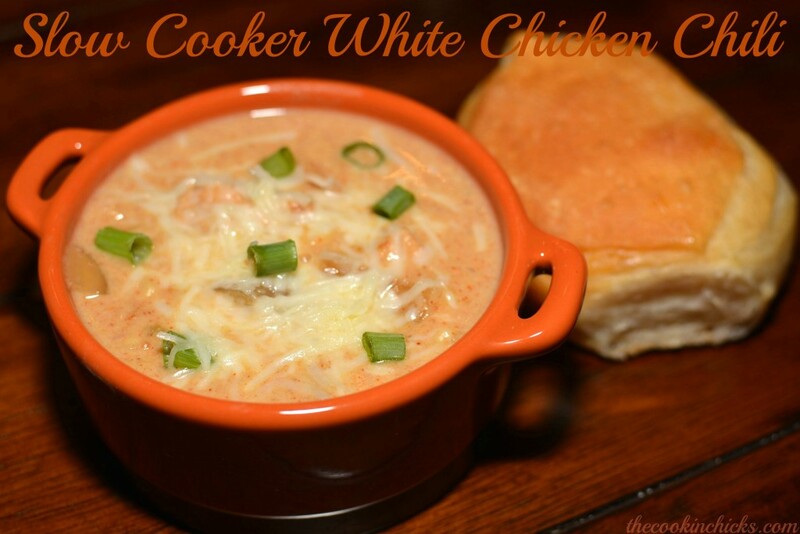 With Fall/winter weather ahead, this is definitely the perfect dinner on a chilly night!! To check out Ashley’s blog, click here….. and to follow her on Facebook, be sure to click here!!! Thanks Ashley for another great meal! Place onion on bottom of slow cooker. Add in diced chicken and spread it over the onions. Drains the beans and corn, add them on top of the chicken. In a small bowl, combine the cream of chicken soup, chicken broth, green chilies, and taco seasoning. Pour mixture over beans and corn in slow cooker. About 30 minutes before serving, stir in the sour cream. Serve in bowls with shredded Monterey Jack cheese and green onions on top!! Enjoy!! I would like the nutrition breakdown for your chicken chile please. Did this yesterday very good, hubby went for seconds. Yea!! So glad it was a hit!! Great idea! Sounds like the perfect addition! !